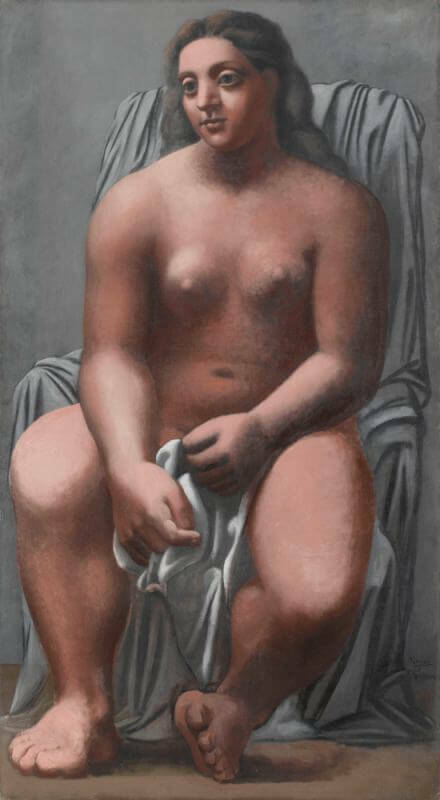 Picasso' obsession with Monumentalism continued as he further explored how to create a dynamic oppositional tension A. between the heavy solidity of the roughly hewn Neo-Classical body shape, which appears here crammed into the confines of the picture frame, and the apparent movement of the undulating folds of fabric. Again, the folds are heavily exaggerated and formed from a dramatic use of colour, this time a verdant green edged with silver, to add to the heightened sense of relief. This static-motion polarisation is explored within a gargantuan framework as Picasso shifts Cubist preoccupations with space definition on to a grander scale. Large Bather is one of relatively few paintings by Picasso in which the figure is well over life size, and because she is crammed into a space which seems barely large enough to accommodate her, the effect of monumentality is greatly increased. The sense of massive size and cumbrous weight is equally potent in some of the greatest fresco paintings from Herculaneum and Pompeii for in these the brightly-lit life-sized bodies of the women push out from flat backgrounds. Picasso must also have been impressed by similar effects in the great fresco cycles of Michelangelo and Caravaggio that he saw in Rome.